The appearance of a spiritual leader for the whole of humanity (not expected by most to take place yet, or perhaps anticipated in a different way) raises several questions for many, believers and non-believers alike. 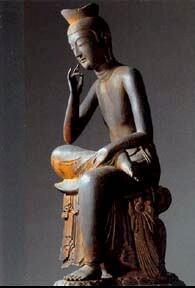 Both are unconsciously hindered in their response to this appearance by backgrounds which may prevent them from seeing Maitreya in His true function and identity. This will, perhaps, make it especially difficult for devotees of the various religions to accept Him as He is. They are often bound, to a greater or lesser extent, by the traditional framework of their faith from which it is difficult to distance themselves. What these various religious traditions have in common is the expectation that their spiritual leader (or his successor) will intervene in the flow of history in a most extraordinary manner. Unfortunately, a further common belief is that the members of their particular religion are 'chosen' and that the Teacher will bring to them, and only them, paradise, either in this life or hereafter. The reality is different. It was their followers, not the Buddha, Krishna, Mohammed, Jesus or Zoroaster, who threw up barriers between faiths and people. The great spiritual leaders in all eras have always emphasized the one, undivided humanity. It was not these teachings but their incorrect application which led to religious wars, intolerance, inquisitions and separatism. The key to a better understanding of the work of the great spiritual teachers is that they have always worked together, as members of a group known as the 'Spiritual Hierarchy'. This Hierarchy has always supported humanity on the long path of evolution, unnoticed for the most part, working behind the scenes, but occasionally openly when the time was ripe to reveal an important, new teaching. Time and time again, these public missions have thrown into confusion a humanity equipped with too little knowledge to fathom or correctly interpret the succeeding events. In particular, announcements by various teachers of a future 'return', and predictions couched in symbolic terms of the conditions which would surround such a happening, have led to much misunderstanding. A good example of this is the difficulty that the Jews had in recognizing and accepting Jesus as the long-awaited Messiah, especially in relation to their firm conviction that he would assert himself as a strong political and military leader. Yet Jesus was the promised new leader – but in a way not understood by Jews or Christians. A new revelation is not always given by a Master of the Wisdom in person. Use is frequently made of a disciple who has accepted the task of functioning as a vehicle for his Master. Jesus was such an initiate disciple, who for the three years of his mission, from the baptism in Jordan onwards, was 'overshadowed' by his Master, who is also the Master of all the Masters: Maitreya the Christ. Hence Christianity has wrestled for centuries with the question of the dual nature of Jesus, now a Master of the Wisdom Himself. The claim made by Christians that Jesus was the only son of God is therefore incorrect. Everyone is a son or daughter of God, as Jesus said. But most of us are divine only in potential and it is the Masters and their most evolved disciples alone who may be called 'Sons of God' in the esoteric sense: people who have brought the divine qualities in themselves to complete unfoldment. The predictions of spiritual teachers in the past about 'Their' return were pointing, without exception, to the events now unfolding, as the world moves into a new era. Not the 'end of time' but the end of an age and the beginning of a new cycle. This is why Maitreya is now here. This time He is not working through a disciple as an intermediary but He has come Himself from His ancient retreat – a valley high in the Himalayas. 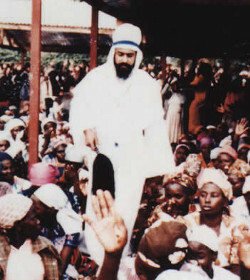 In July 1977 He took up residence in the Asian community in London, where He has subsequently worked, preparing for His appearance before the entire world and as teacher for all humanity – Christians and Jews, Buddhists and Taoists, Hindus and Muslims, and also, to the same degree, those who follow no religion. Above all, the appearance of Maitreya must not be seen as an exclusive event for 'believers', to which non-believers cannot relate. The Masters of the Wisdom and their disciples are not a 'religious' phenomenon. They have tried repeatedly to teach humanity the principles of justice and brotherhood, about the need for right human relations, and consequently a correct relationship between man and God. However, the churches have invariably laid emphasis on the mystical element, and at the same time have monopolized the notion of spirituality, claiming it exclusively for the religious field. The religious path, however, is only one way. The artist, the politician, the scientist, the manual worker, everyone – believer or non-believer – can live a real spiritual life. The deciding factor here is whether or not they are working in the service of humanity. Maitreya, too, gives the highest priority to service. He points to the inhumanity of a world which forces farmers in America and Europe to reduce production while every two seconds a child dies of hunger; a world in which poor countries groan under the burden of intolerable debts while the industrialized countries spend hundreds of billions of dollars on weapons. Maitreya will make it clear to us that we face a major decision: either we change the way we relate to one another, taking sharing as our guiding principle, or we continue in our present selfish, competitive way, and destroy ourselves. We shall have to make our choice in complete freedom: Maitreya is a teacher, an adviser, a guide. It is up to us to decide whether or not to take His counsel to heart. But He has already said that our reaction can be predicted: we will choose to implement His teachings. This means that we are at the beginning of a new time: a time of enlightenment, of extraordinary scientific achievement and of right human relationships; a time of a new understanding of that which we call God, and of Maitreya, the Hierarchy and mankind within His Plan. "We now know that SATAN is not a fallen angel...SATAN and other angels help GOD administer THE TEST..."
"THE TEST began in the garden of EDEN, mankind was given a choice between "good" and "evil, unfortunately man chose "evil"